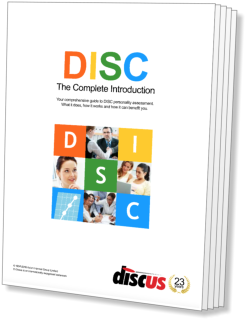 Collecting the answers to a questionnaire is the first step in creating a DISC profile, and Discus gives you a whole range of ways to do that. The simplest and most efficient way to handle questionnaires is to use Discus' Invitations feature, and we'll look at that in detail first. If you need another approach, Discus is flexible enough to meet your needs, with multiple questionnaire types and techniques in many different languages. The most powerful of the Discus testing options is the Invitation feature, so-called because it revolves around inviting a candidate to complete a profile directly online. All you need to do is enter an e-mail address, and Discus will take care of everything else, setting up an online questionnaire and inviting that person to complete it for you. Once that person has entered their responses, Discus will immediately compile their results ready for you to view their DISC report. Send invitations to multiple different candidates with a single click. Set up questionnaires in any of Discus' huge range of different language options. Display the questionnaire to your candidates using your own branding and colour scheme. Send reminders to candidates as required. Receive an e-mail notification as soon as results are available, optionally including a copy of the newly created report. Discus Invitations offer you efficient and direct online profiling, but Discus also gives you plenty of other options to suit your particular profiling needs. Invite a candidate to complete a DISC questionnaire online through their Web browser. Run a DISC questionnaire for a candidate to complete directly on the screen. Create and print a custom DISC questionnaire ready for manual completion. If you prefer to conduct supervised testing on your own premises, Discus also provides real-time questionnaires for that situation. Questionnaires can be run directly on the screen, or if you prefer to use paper questionnaires, Discus will print as many as you need at no charge. All these direct questionnaires are also available in the range of standard Discus languages, and if you're using printed question sets, Discus even provides a specially designed entry system that lets you enter and check the answers in a matter of moments. Inviting candidates: Just enter a candidate's e-mail address to have Discus invite them to complete an online questionnaire, and manage the process for you. DISC results are available as soon as the online questionnaire is completed. On-screen questionnaires: Complete a DISC questionnaire directly through your own browser display. Paper questionnaires: Print unlimited paper questionnaires, and quickly enter candidate responses through Discus' custom entry system. Questionnaire options: All Discus questionnaires are available in three variants to suit your profiling needs, and in dozens of different languages. Global device support: Online Discus questionnaires are designed to work on any device, from a desktop browser to a handheld phone.